Since the new Kalkbreite urban development opened this August, it’s been the talk of the town. 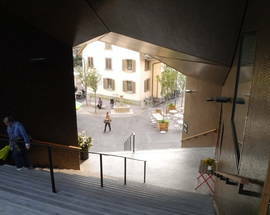 Nearly everybody we know locally has been to take a peek at this urban experiment at the end of Zurich’s Langstrasse. The modern architecture, the alternative residential arrangements and the restaurants, shops and cinema make it a must-see for visitors too. New Kalkbreite is more than just another residential development. The Cooperative Kalkbreite which devised and developed it is dedicated to inventing a new way of living in the city – one which is ecological, culturally diverse and ready for tomorrow. One aim was to meet the requirements of the 2000-watt society – i.e. keeping energy consumption under 2000 watts per person, or 48 kilowatt-hours per day, which is just a third of what we typically consume in Western Europe. The experimental living arrangements are one of the keys to this. Some residents live in so-called cluster flats which share one central common room and a large kitchen, while all the private units have a mini-kitchen and a bathroom. This uses less space and energy than living in a normal flat – but you still get more privacy than in the kind of standard flat-share you may remember from your student days. It also means you can choose to live on your own without the risk of getting miserably lonely, you just have to pop to the kitchen for a chat. Another living arrangement at Kalkbreite is the community household, where a dozen flats share a common dining space and a professional chef who cooks dinner. 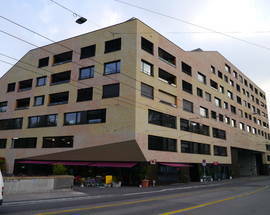 There is also shared office space for rent, as well as so-called joker rooms which residents can rent temporarily e.g. for putting up their extended family. Kalkbreite residents are not allowed to own a car, saving more energy. The development does have a huge garage – but it’s only for the trams, which were actually here first. Kalkbreite was built on the grounds of a tram depot and the trams still have their home in its belly. Kalkbreite is also extraordinary in terms of architecture. 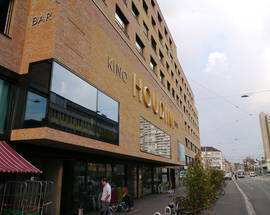 Architects Müller Sigrist succeeded in giving the giant (for Zurich standards) remarkable character, what with the overhanging entrance, the subtle colour scheme or the lounge of the cinema that breaks the facade. 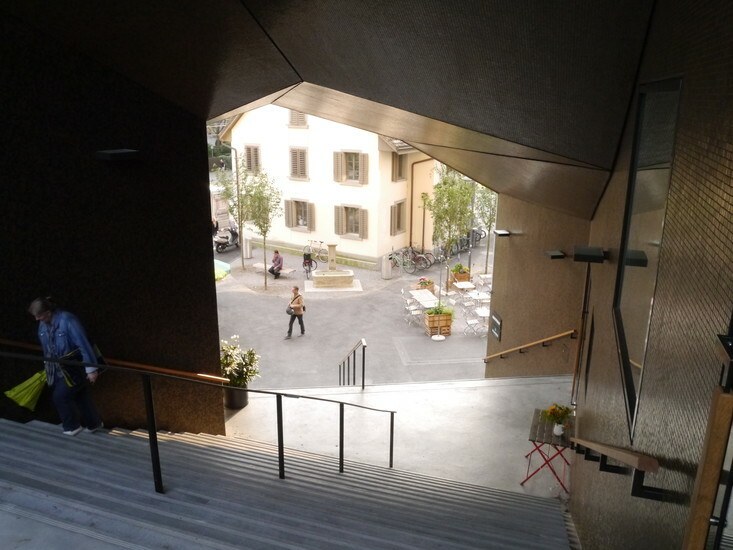 By requirement of the city, the inner courtyard is public and is accessible by a flight of stairs that pierces one corner of the building like a tunnel. The courtyard offers a public playground and at the far end you can climb a few stairs to a terrace from where you have a view over this whole part of town. You can’t go right to the top though, those terraces are private! Kalkbreite is not just residential either, and that is a major part of the plan. There are 24 businesses on site – which makes a visit even more interesting. The mix of residential and business space is an attempt to keep travelling distances short and make it easy to live without a car. The Bachser Märt e.g. sells groceries that are produced mostly locally including organic vegetables straight from local farmers. 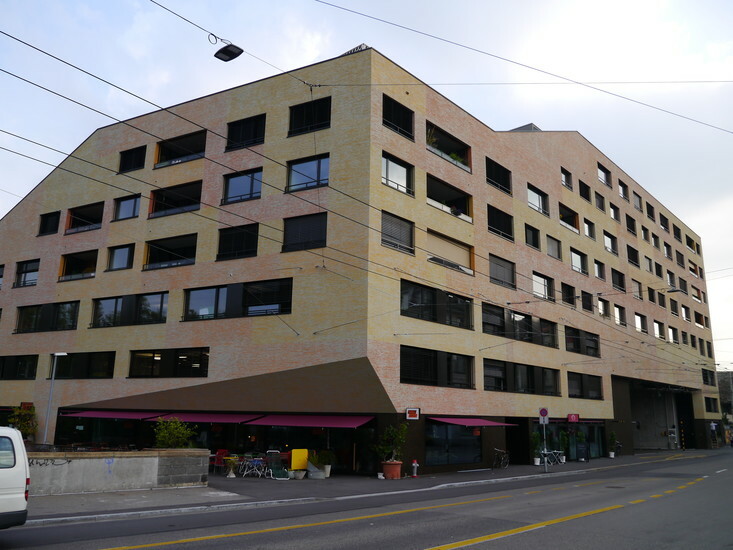 There is also a shop for second-hand furniture (Möbel Zürich) and a lovely café that specialises in handmade cupcakes (Oh! Sweetest Thing). At the restaurant Bebek they serve organic oriental food – and a huge window lets you peek through to the trams inside the depot while you eat. 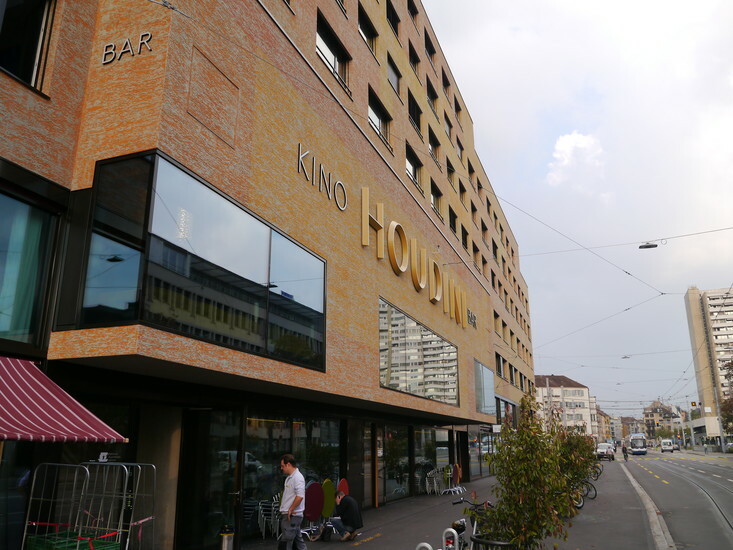 The cinema Houdini and a few other cafés and bars round off the range of cultural venues. Kalkbreite is a successful example of innovative urban development. And while not everyone will want to live in a community household in the near future, Kalkbreite does set standards for future developments. 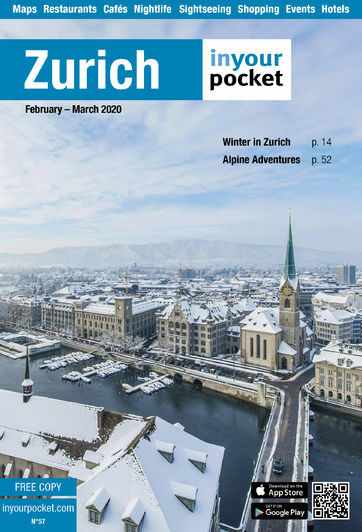 It’s well worth a visit for exploring the urban future – of Zurich and elsewhere.